Once the Panama Canal was opened to commerce in 1914, the Islands lost importance as a strategic location on a major trade route, but it has recently been discovered that there may be large maritime deposits of extractable oil surrounding the islands. While Binot Paulmier de Gonneville may have been the first to sight the islands as a French explorer, the first widely accepted official sighting of the islands was by Sebald de Weert on behalf of the Dutch in 1600. Although it was only a naval base, Louis de Bougainville of France was the first to have established a settlement on the island in 1764 naming the islands Îles Malouines. The following year John Byron claimed Saunders Island and others, and the following year would see Britain build a settlement on Saunders Island a year later. Thus, the first two settlements on the islands were by the French who were followed closely by the British in 1766. 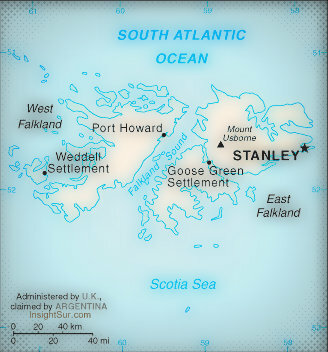 The Spanish came to claim the East Falkland island due to a treaty which the French which forced the surrendered of their settlement to the Spanish. In 1770, the Spanish showed up with five ships and 1400 soldiers forcing the British to leave. The tiff was settled, the British returned to the island, and the Spanish returned all stolen goods from the incident. Largely because of increasing resources required to attempt to subdue the American colonies in the American War of Independence, the British left the island in 1776, but left behind a plaque asserting British dominion. In 1790, the Nootka Convention ceded British possession of Spain’s traditional territories in the Americas; however, it is not clear whether or not this included the Falklands. The islands were largely used by sealers and whalers until 1820, when the island was claimed by Captain Jewett for the United Provinces of the River Plate which later became Argentina. And so, between 1600, and 1820, the islands had been claimed by the Dutch, French, British, Spanish, and finally, the nation which would become Argentina. In 1825, Britain recognized Argentina’s independence from Spain, and 4 years later Argentina claimed dominion of the Falklands, Britain protested, and thus began the nearly 200 year old spat between the nations. In 1833, just 4 years after Argentina contested British rule of the islands, Britain re-established control of the islands, and Charles Darwin made his first visit. In 1840, the British officially approved the formation of a colony on the islands. Of interest in the dispute, is that in 1841, an Argentine general by the name of Juan Manuel de Rosas offered to relinquish any claim over the island to the British in exchange for a debt settlement between the countries; however, the offer was declined by the British, who had controlled the islands for 8 years. Such a clear and unambiguous deal may have allowed the countries to avoid altercations which have persisted to this day. Yet in 1850, the two countries signed an accord which ended hostilities between the nations, and although the Falklands are not explicitly mentioned in the treaty, Argentina would not protest Britain’s sovereignty over the islands for another 38 years, and once signing the treaty, Argentina ended a practice of yearly sending officials to London asserting their claim. Even prominent Argentinian historians admit that this treaty significantly reduces any legal claim Argentina would have to the islands. Over the next century, Argentina would make various claims to the islands, but British offers to settle the dispute through a third party were rebuffed in 1947, 1948, and 1955. Since then, Argentina has been antagonistic to the British and their control of the islands. Often, the islands are used as a symbolic rallying point for Argentinian leaders to take advantage of nationalistic sentiment. Current Argentine president Cristina Fernández de Kirchner has recently dredged up the dispute as the country struggles through the impacts of bad economic policy, and political policies trending towards Fascism.